The Swede-O® Ankle-Lok® Ankle Brace has been proven superior for injury prevention, rehabilitation, joint stability, comfort and durability versus other ankle braces we have tested. It is the only ankle brace we offer and continues to be a favorite among all types of athletes-including those with previous grade I, II and III ankle injuries. The patented Ankle-Lok system keeps brace tight and properly positioned while side-stabilizing inserts deliver additional support. Vinyl construction. Fits comfortably in most athletic footwear. Fits right or left foot. 1 per pack. The best ankle brace we've ever tested. See package for detailed directions. Lace product loosely from bottom to top. Pull on over socks. Add one or more optional external stabilizers if desired (plastic pieces fit inside sewn pockets along sides of brace). Tighten laces from bottom to top. Pull on footwear. 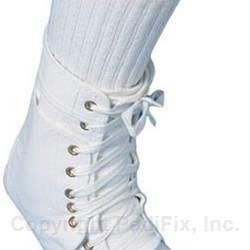 For maximum stability, tighten and re-tie laces as needed. Product may be wiped with a clean, slightly-damp cloth. Allow to air dry completely before reuse. Product contains natural rubber latex which may cause allergic reactions. Do not use if you have diabetes or poor circulation. Do not use over open wounds. Discontinue use immediately if this product causes discomfort, irritation, numbness or pain.